Have you heard of the term “Smash Factor”? Smash Factor is the term used for the measurement of your ball speed, divided by your clubhead speed. 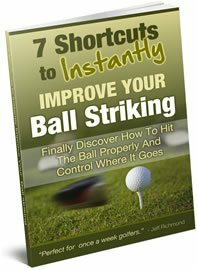 This measurement is so important, because it tells you how well you hit the ball in terms of transferring speed into the golf ball. And the largest influence on this measurement, is how accurately you’re hitting the ball on the sweetspot. The penalties for not hitting a shot on the center of the clubface are huge. For example, in 1998 Golf Digest did a study into how much off-center impact shots affect distance. Here is the result of the study for a 100 mph swing. So contacting a golf ball an inch off the center of the clubface with a 100 mph swing speed, results in a 31 yard loss of distance! Ok, it’s pretty clear that contacting the ball on the center of the clubface is pretty important for distance! And I’m going to give you a cool way to measure your smash factor. Before I share that with you, let me just say, there are a number of very expensive pieces of equipment that will give you your smash factor. One is trackman, and this piece of equipment costs about $25,000. Naturally, for the average golfer, that is out of the question. You could probably get on one of those machines to see your impact numbers, but you probably couldn’t get on one often. So here’s my DIY way to workout your smash factor and try to improve it. This is the one I recommend you get (you’ll need two remember) for this. 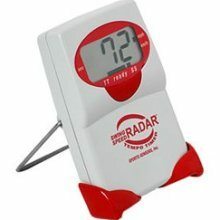 Once you have two portable swing speed radars, you’ll also need a calculator (you probably have one on your cell phone). 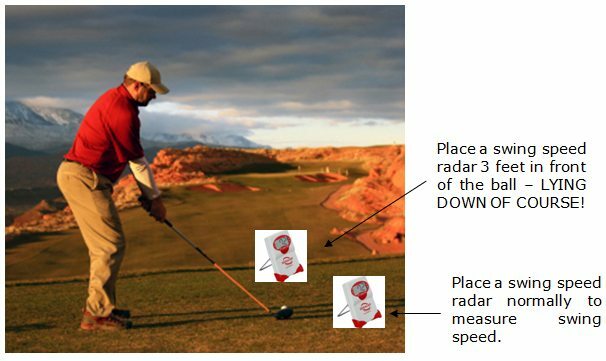 Then you need to setup one swing speed radar so it records your swing speed, and the other one laying on the ground 3 feet in front of your ball so your ball flies over it. 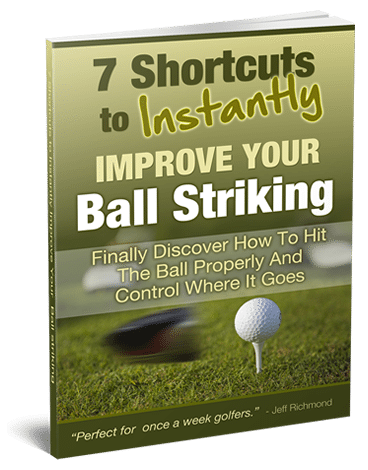 Once this is setup, then you simply need to hit drives so your ball flies directly over the swing speed radar that is lying on the ground. When you do that you’ll get two results. One will be your swing speed, and the other will be your ball speed. Let’s say your swing is 90 mph and your ball speed is 120mph. So you simply divide 120 (ball speed) by 90 (swing speed) and you get 1.33. That’s your smash factor. Apparently Tiger Woods has a smash factor of 1.48, whereas the average golfer has a smash factor of 1.20. So if you find your smash factor is about 1.20 when you do this, then simply by increasing this number will mean longer drives – and that will be exciting. Your goal should be to have between a 1.47 and 1.5 smash factor. So there you go, that’s a very cheap way for you to measure smash factor. It’s a critical stat when it comes to distance. So put that into action, improve your smash factor and reap the rewards. Important Note: You may find when you do this that the center of your clubface (on a driver) does not produce the highest smash factor. That’s because for most modern drivers the sweetspot is above the center of the clubface.